Etching by Antonio Fantuzzi, 23.8 x 31.6 L (London). Bartsch, XVI, 1818, 428, 129, as Anonymous, School of Fontainebleau. Herbet, II, 1896, 272 (1969, 68), 12, as Fantuzzi, stating that the attribution is due to Robert-Dumesnil. Zerner, 1969, A.F.49 (Vienna, It.III.3). COLLECTIONS: London, 1850-5-27-135 (upper right corner missing). Vienna, It.III.3, p.43, bottom; Vol. XIII, 2, p.66, no. 423 (very damaged). Berliner, 1925-1926, I, Pl. 118.2, Text Volume, 42, as Fantuzzi. Kusenberg, 1931, 166, as Fantuzzi, in the style of Rosso, and perhaps after a lost decoration at Fontainebleau. Zerner, IB, 33, 1979, 404 (Vienna, It.III.3). Carroll, 1987, 335, n. 12, under no. 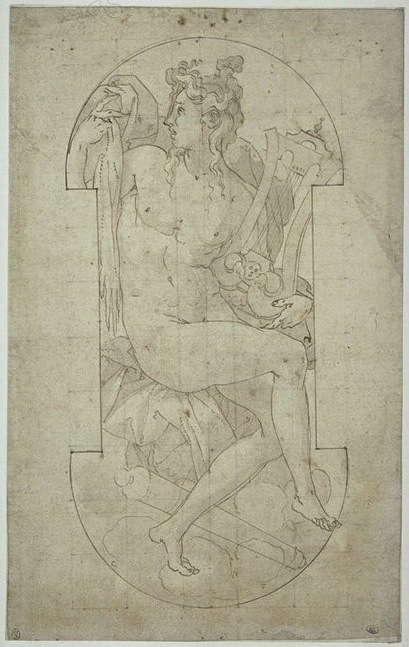 104, as possibly after a lost drawing by Rosso for the decoration of the Salle Haute at Fontainebleau [L.43]. As Kusenberg suggested, the style of this cartouche resembles Rosso’s, and it could possibly reflect a design of his. The incomplete shape at the left could be part of a circle but it could also represent the end of an oval. In either case, the complete cartouche would be quite long and both possibilities suggest its use as a frieze. 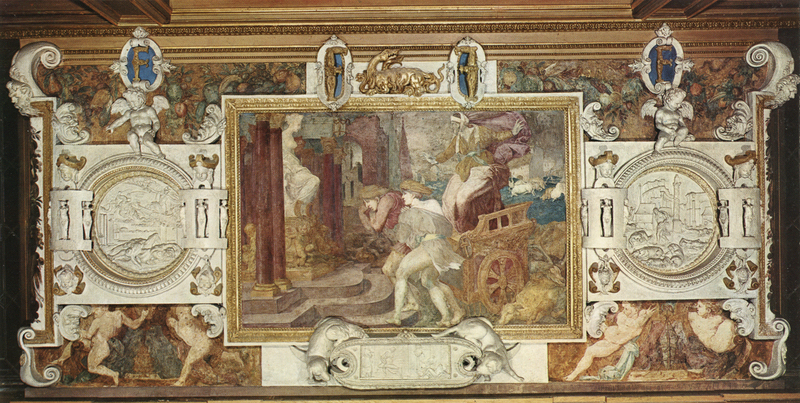 Vasari records that the Salle Haute of the Pavillon des Poêles had a frieze of stucco by Rosso, but without paintings (see L.43). 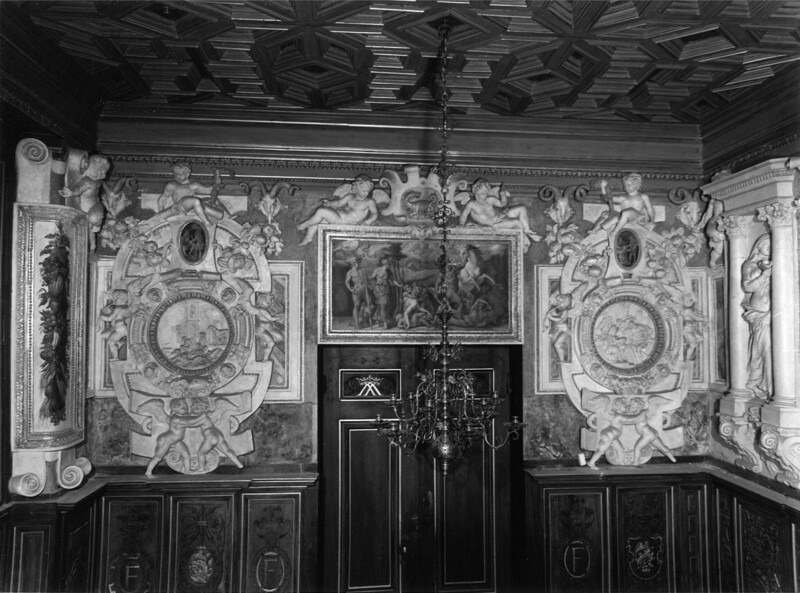 Where Fantuzzi placed landscapes, Rosso would have placed figured scenes, and stucco ones could have been intended, as on the West Wall (Fig.P.22, WestWall, a) and at either side of the Cleobis and Biton in the Gallery of Francis I (Fig.P.22, V S a). Or Vasari was mistaken and the frieze in the Salle Haute that he had never actually seen himself did have small paintings framed by stucco. Small round paintings also appear in the gallery on either side of the Loss of Perpetual Youth (Fig.P.22, II S a). 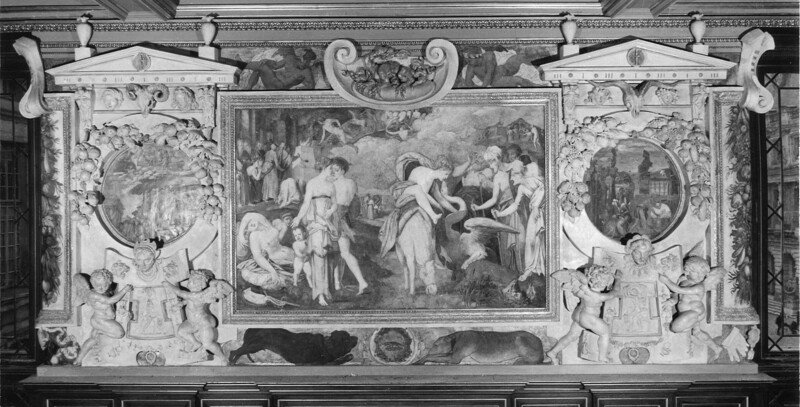 One might also point out that the young reclining woman in the cartouche has a small crescent moon on her head, indicating that she may be Diana. According to Vasari, the major large figures in the Salle Haute were a series of seated gods and goddesses. What the frieze showed he does not say. But representations of gods and goddesses could appropriately have also been found there. 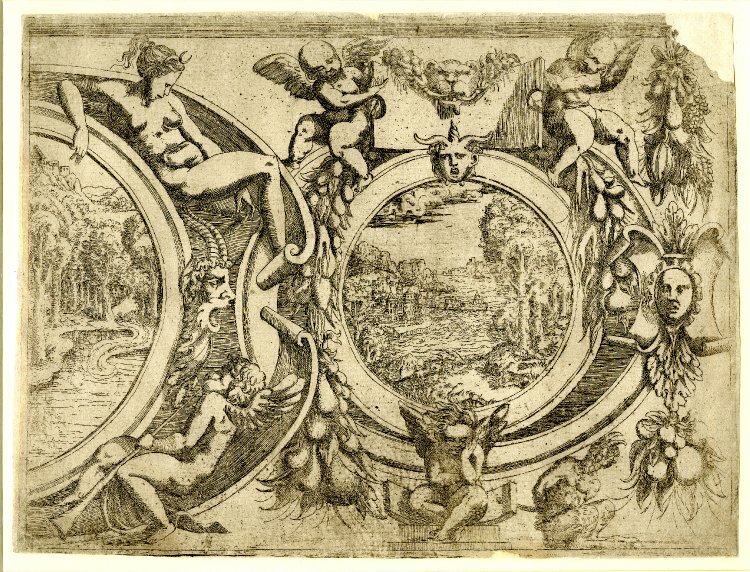 The design of Fantuzzi’s cartouche is very much in the manner of Rosso, in its figures, its garlands, its variety of motifs, and in their spacing and composition. It also has a sentiment of seriousness and playfulness that speaks of this artist. 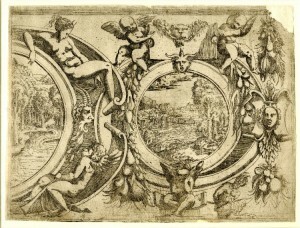 It is quite likely that Fantuzzi used a drawing in reverse by Rosso for this etching, and it is possible that that drawing was made for the Salle Haute in 1537 or 1538. The slender proportions of the figures in this etching are very similar to those of Rosso’s Apollo holding a Lyre in the Louvre (Fig.D.76Aa), a drawing that was almost certainly made for the decoration of the Salle Haute. For other prints related to this project, see L.43.